Dark Essence Records have today revealed details, including the artwork and track-listing, for “De Gjenlevende”, the upcoming album from Norwegian black folk metallers Galar. 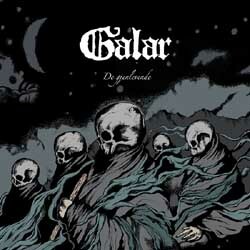 Mixed and recorded at Bergen’s Conclave and Earshot Studio by producer and Vulture Industries’ frontman Bjørnar E. Nilsen, “De Gjenlevende” (The Bereaved) is a follow up to 2010’s “Til Alle Heimsens Endar”, and will be Galar’s third-full length album. Artwork for the album is by Robert Høyem of graphic designers Overhaus. “De Gjenlevende” sees Galar’s founders M. Kristiansen (screams, guitars and bass) and A. B. Lauritzen (clean vocals, bassoon and grand piano) and drummer Phobos (Aeternus, Gravdal, Malsain), joined by several session musicians that include both a string quintet and a horn quartet which fit in with the epic nature of the material, both musical and lyrical, that has been created for the six-track, concept album. Entirely written in Norwegian, the track entitled “Ljós” will be an instrumental, whilst the other tracks are longer, and more epic than previous work by the band. Jorge Blutaar, the band’s lyricist, recently briefly explained the concept behind the album, which draws its inspiration from Pan-European folklore, ontology, and elegies. “Its five contemplative texts tell of the utter dreadfulness that haunts both the human mind and body when the season of winter holds every living thing in its grasp. Winter is the time of utter gloom, enfeeblement and inescapable death, which challenges mankind, beasts and plants equally. Yet, as long as there is life, there is hope, and eventually a new era of the Sun will bring to an end the seemingly eternal darkness of winter. With the arrival of spring hope and life will flourish once more. It is a portrayal of this cyclical process of transformation that is as old as the history of mankind itself”. Fans worried about not understanding the Norwegian lyrics need have no concerns, as the album comes with an explanatory booklet. Estimated date of release is the 20th of October 2014 and the tracklist is as follows.